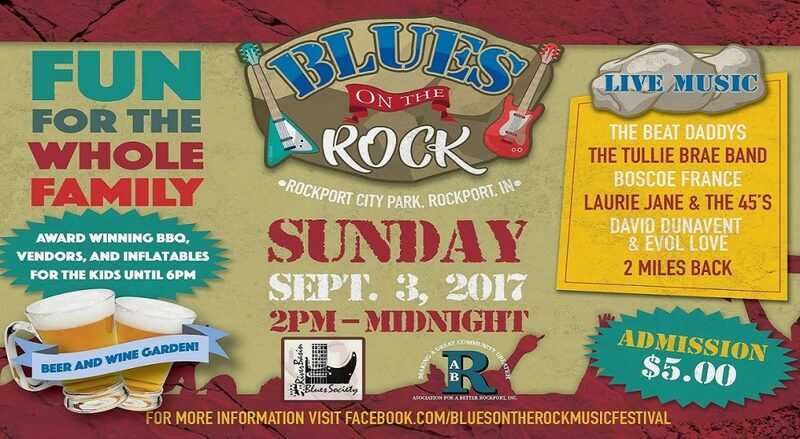 The 3rd Annual Blues on the Rock (BOTR) will be held at the Rockport City Park on Sunday, September 3, 2017, in Rockport, Indiana. This year’s festival finds the same great atmosphere and provides a terrific way to celebrate the Labor Day holiday! A $5.00 admission at the gate brings a day of food, barbeque, a beer garden, and inflatables that offers fun for the whole family. This year’s festival is sponsored in conjunction with the City of Rockport, the Association for a Better Rockport, and the River Basin Blues Society. The gates open at 1 pm and, at 2 pm, the music commences with a line-up of great blues. For more information about the 3rd Annual Blues on the Rock visit evansvilleblues.com and facebook.com/bluesontherockmusicfestival. Want to sponsor this event? Click here for the form. David Dunavent and Evol Love opens the show with their style hard-hitting blues rock from the Mississippi delta. David has played alongside some of the greats in blues and is a house tech at Ground Zero in Clarksdale, Mississippi. David Dunavent and Evol Love serves up a fireball of Delta, Texas, and Chicago Blues that blazes a trail of high energy that is sure to please! Laurie Jane and the 45s returns this year after torching the stage at the first festival. Proudly representing Louisville, Kentucky’s musical legacy, the band creates a sound that is a melting pot of 1950’s big city electric blues with the early rockabilly that is the heart and soul of blues fans everywhere. 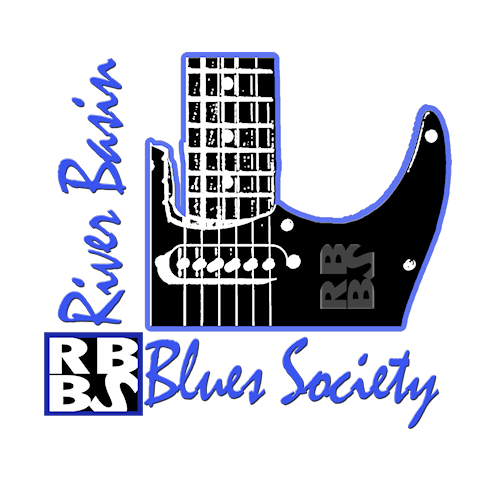 The band represented the Kentuckiana Blues Society at the 2017 IBC and did the region proud. The group release their debut CD, Laurie Jane and the 45s, in 2015. Boscoe France takes to the BOTR stage this year for the first time. After a lifetime of living and playing the blues, Boscoe rolled through the competition and was crowned the Guitar Center Battle of the Blues grand prize winner in Los Angeles in 2012. He is now a rep for Paul Reed Smith Guitars and has a new release out entitled 1500 Miles which is featured locally on “The Case of the Blues” as part of the blues programming every Saturday on WUEV 91.5 FM. The Tullie Brae Band brings its brand of blues to the festival stage this year with the same soul and sass that has made it popular all through the blues festival world. Tullie Brae is a soulful blues singer and multi-instrumentalist whose roots are steeped in gospel. She has traveled many miles and gathered inspiration from the common buffet of musical influences. At this year’s Blues on the Rock, the audience will experience Tullie’s heart and soul during her performance. Regardless of the music, everyone will see what it means to get “Tullie-ized”. 2 Miles Back returns for a third year to the BOTR Stage. A Spencer county original, this group is one of the best house bands in the area. 2 Miles Back will be taking the stage as the last act of the festival, leading up to the midnight hour, to motivate those who want to keep the beer garden blooming. 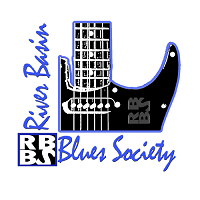 Members of the River Basin Blues Society (RBBS), 2 Miles Back have played several RBBS events, including a blazing set at the 2016 River Basin Blues Blast. Bringing you a mix of southern and classic rock, 2 Miles Back spins a twist of blues into everything they do. The Beat Daddys have been at the peak of the blues for over 3 decades. Beginning in 1986, by core members Larry Grisham and Tommy Stillwell, the band has been bringing house rockin’ rhythm and blues to all who love the music, as well as bringing in new fans year after year. With nine international album releases, several film and TV soundtrack credits, as well as countless shows, both in the U.S. and abroad, the group has compiled the ultimate blues resume. The Beat Daddys could also be found onstage with many Blues and Rock and Roll Hall of famers. The group’s latest release, Hoodoo That We Do, is now on sale and includes “Big” Jon Rochner (bass) and Dave Parks (drums). Find out more about the band at thebeatdaddys.com.